A tasty vegetable dish that is perfect all year round, serve alone with salad or with pasta on the side. 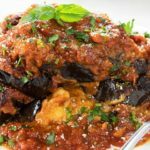 This Italian recipe for Baked Eggplant Parmesan uses roasted eggplant instead of fried making it a simple, cheesy vegetarian meal. When I was growing up, my Italian Grandmother used to salt and press eggplant slices all day to remove the extra moisture from them. Once that was done, she would bread and fry each individual slice before assembling it into a layered dish. It was amazing, but who has that kind of time? 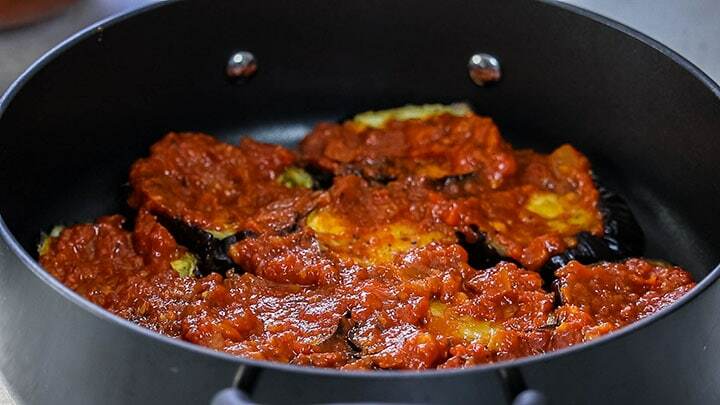 With this recipe, there’s no salting the eggplant slices, you just cover them with some oil and seasoning and throw them in the oven before assembling the dish. 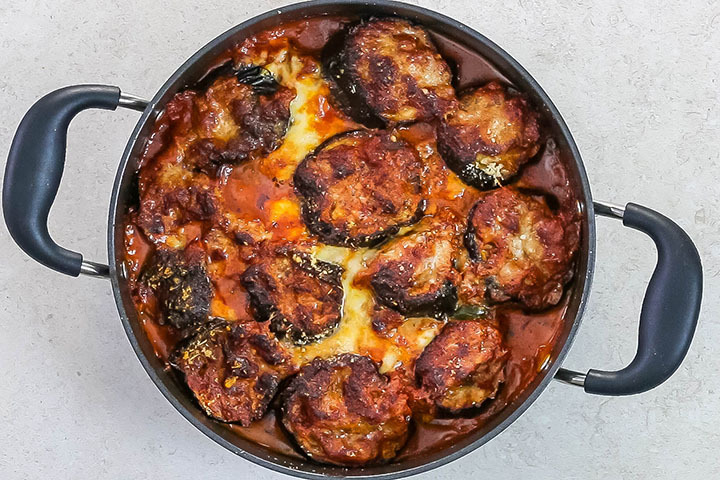 This eggplant casserole is also great to make ahead. Just assemble and bake later! Roasting the eggplant with the skin on makes it not only easy but ensures the eggplant is fully cooked when assembled. Adding the basil between layers adds an extra depth of flavor. 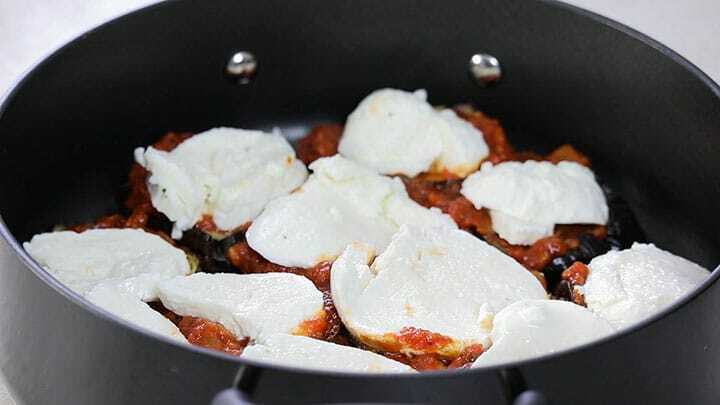 Using wet mozzarella (or Buffalo Mozzarella) keeps it in place instead of spreading when baked. The Parmesan cheese creates a beautiful, crisp topping that finishes the dish perfectly. To keep things Simple, you can use jarred sauce, but I suggest my Simple Marinara Sauce or Easy Homemade Tomato Sauce and to serve it alongside my Perfect Garlic Bread for a meal your whole family will love! 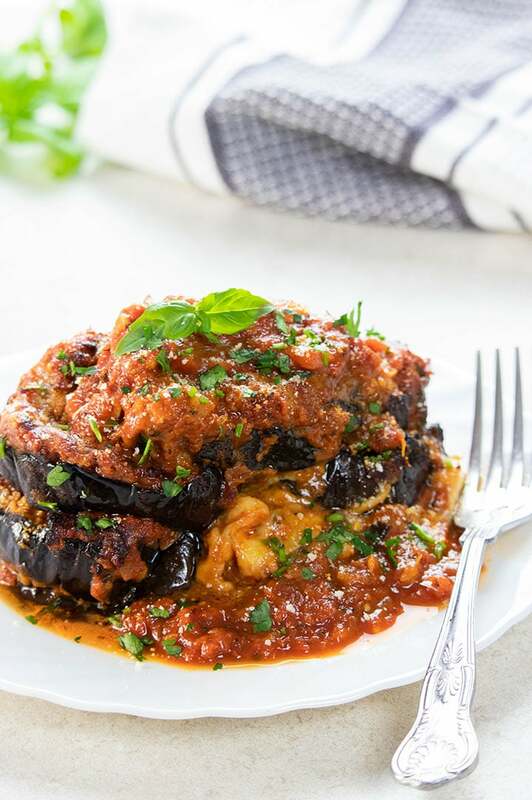 This eggplant is a dish is full of flavor and healthy too! It’s perfect if you’re cooking for a vegetarian, cutting back on carbs or following a Keto Diet. Start by slicing the eggplant into 1 inch thick slices. Place onto a baking sheet lined with baking paper or nonstick foil. Brush with olive oil (the top or both sides. The choice is your’s). Roast until golden (about 30 minutes). 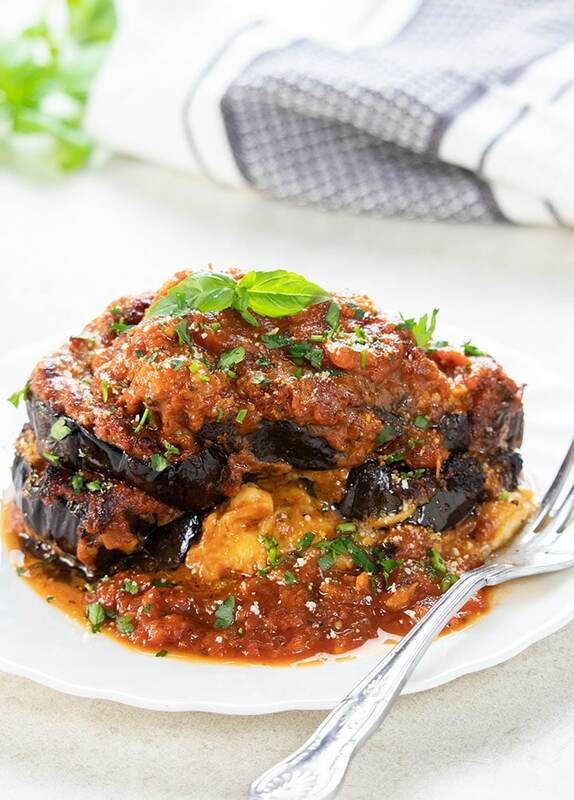 Line a 10-inch casserole pan with a single layer of the roasted eggplant using half the slices. Top with sliced of mozzarella. 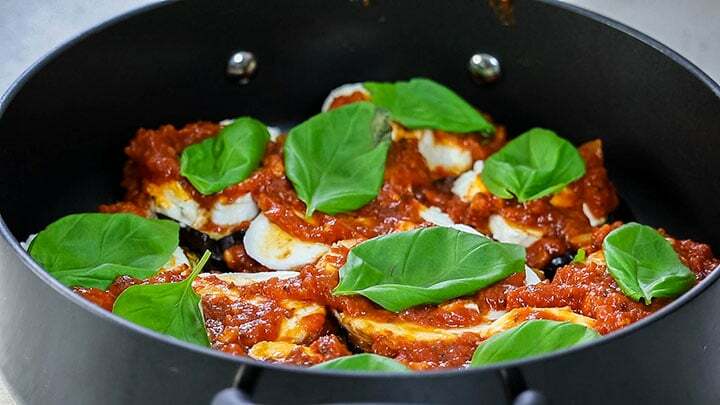 Top with more sauce and basil leaves. Top with more sauce and the grated parmesan cheese. Bake until crispy and golden. 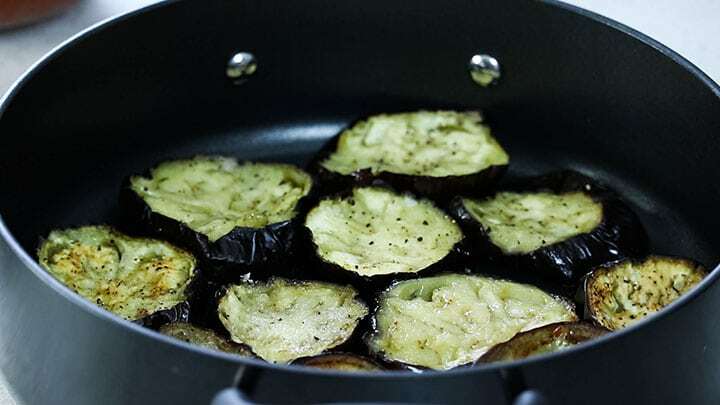 When roasting the eggplant, line the pan with nonstick foil to make it easy to remove. 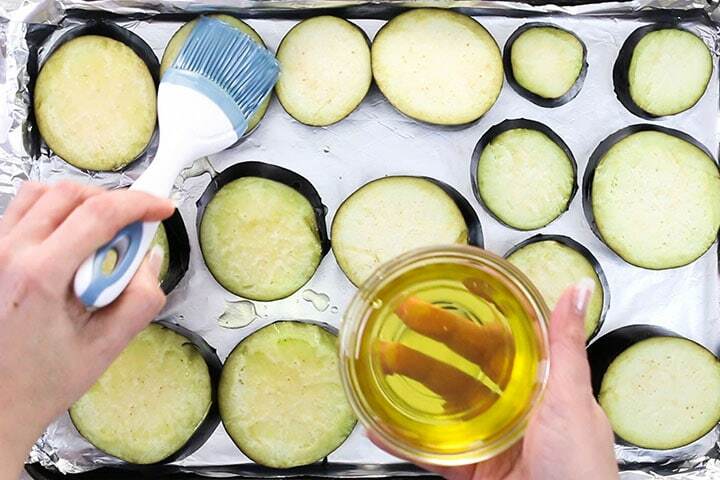 To avoid greasy eggplant, only oil one side of the slices. For a low-fat version, use low-fat cooking spray in place of the oil when roasting the eggplant. For the tomato sauce, use a good quality jarred sauced or try it with my Simple Marinara Sauce or Easy Homemade Tomato Sauce. 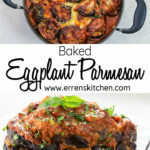 Can I make Eggplant Parmesan ahead of time? 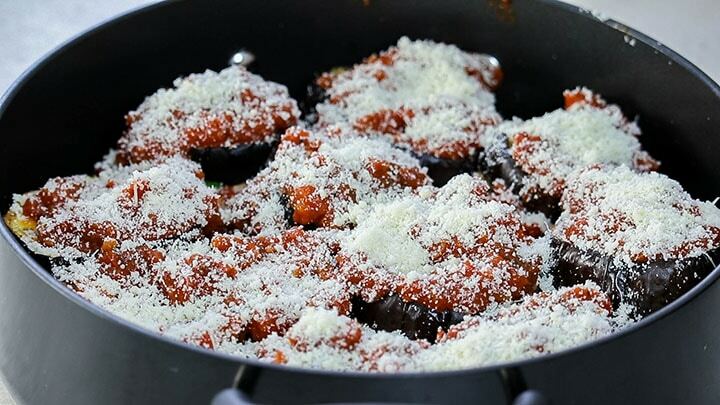 To make Baked Eggplant Parmesan ahead, just make the eggplant, cheese, and sauce layers, cover and refrigerate. Bake from chilled by adding an extra 10-15 minutes to the baking time. Can Eggplant Parmesan be frozen? 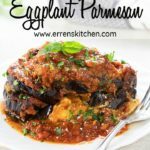 Eggplant Parmesan freezes really well and can be frozen before or after baking by covering the freezer/oven safe pan with a plastic wrap and a layer of foil. Place in the freezer and freeze for up to 3 months. Thaw in the fridge overnight before baking. 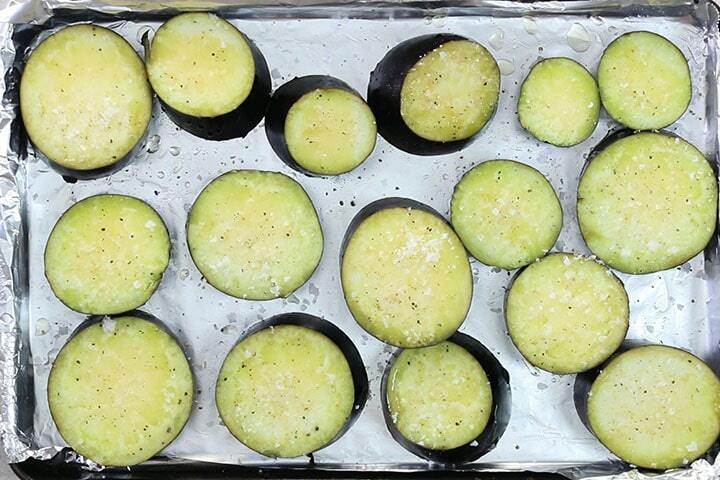 Place the eggplant slices in a single layer on a baking sheet lined with nonstick foil or baking paper. Brush with olive oil and season with salt and pepper. 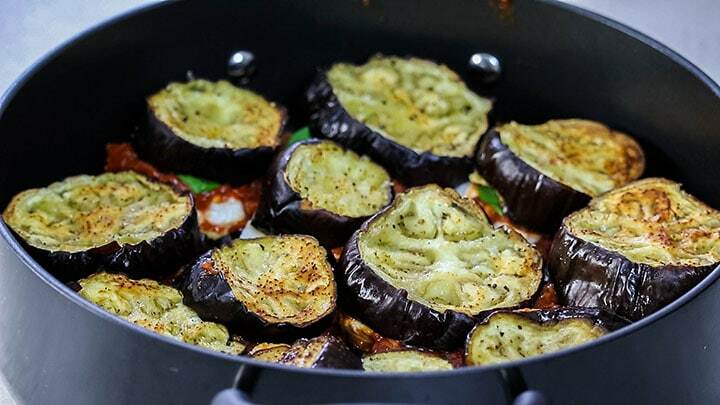 Line a 10-inch casserole pan with a single layer of the roasted eggplant using half the slices. Top with sauce, followed by the mozzarella slices a more sauce, and the basil leaves. Add another layer of eggplant using the remaining eggplant slices. Cover with sauce followed by the grated parmesan cheese. No doubt, this will quickly become a family favorite! It is definitely one of mine, Toni! It is hard work being a food blogger, we are always hungry haha! It’s nice to cook something different isn’t it! I’ll take the whole shebang please. Love eggplant parm. This is one of my favorite meals. I haven’t eaten it in forever. Thanks for the reminder and delicious recipe. This is hands down my favorite meal!! It looks absolutely amazing!! Thank you so much, Katerina, it is one of mine too! I don’t think any dish has made my mouth water as much as this one! Looks fabulous; can’t wait to try it! Beth, Your feedback is awesome!